There are still many schools of thoughts about the shape of universe. The number of scientists has been giving different opinions but yet there is no consensus. In fact answers of such intricate questions are already available on our rare venerated Hindu granths (the ancient holy Hindu religious books). It’s a bitter truth that during the course of time countless Hindu granths have been destroyed, but even the remnants possess the information which our modern scientists have not been able to discover with hundred years of research. Hindu granths are not the only source of such invaluable information, great Hindu saints also know a lot about this unknown treasure of knowledge but they divulge these secrets only to those who deserve it. India’s ancient history, science and religion expert, Doctor Saurabh Upadhyay tells that, in ancient era, pupil of Sun, shri Varah Mihir had explained in his book about the shape of universe. According to Shri VarahMihir, blessed with God Vishnu’s divine inspiration, Lord Brahma created our universe in a shape which looks like two frying pans which are put on each other, forming an elliptical shape. 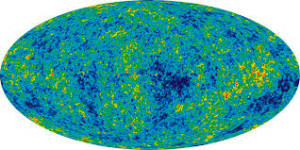 So, the pans kept on each other in reverse direction also signify that this universe also has an ‘anti-universe’. Our earth is located just in mid of this oval shape. Lord Brahma made this universe on the foundation of infinite powers of Omkar sound (ॐ). Seventy million mantras (spells), including Gaytri Mantra, have different special roles in this universe. Gaytri Mantra has extremely important role in the constitution of our universe. Om (ॐ) Mantra is the base of Gaytri Mantra and all other seventy million Mantras. Gaytri Mantra is special expansion form of Om (ॐ). Inside the every particle of this universe, Om (ॐ) exists. Om (ॐ) is the only energy which expresses everywhere in this universe in infinite different forms, shapes, sizes (in the form of all visible and invisible things like different creatures, plants, air, mountains, rivers etc.) and also, Om (ॐ) is that only energy which makes all these things moveable or static. Inside every atom, all moving particles are getting energy only from Om (ॐ) sound. 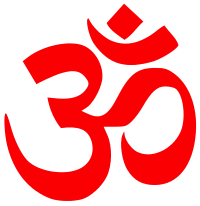 The base of all, Om (ॐ) is Shabd Brahm (word or sound form of God), and this sound, Om (ॐ) is also called Anahat Nad (means the sound that is created without any collision, shock, hit, smash or bump) because this sound has no end or beginning. All the planets of our solar system move around the sun, but does Sun move around any one? Everyone knows that planets move around the sun, but scientists are not sure about sun’s movement around anything! Professor Saurabh tells that our ancient books mention that Sun moves around biggest Sun (in Sanskrit language which is called Maha Surya). And this biggest Sun is nothing else but God Vishnu’s navel. 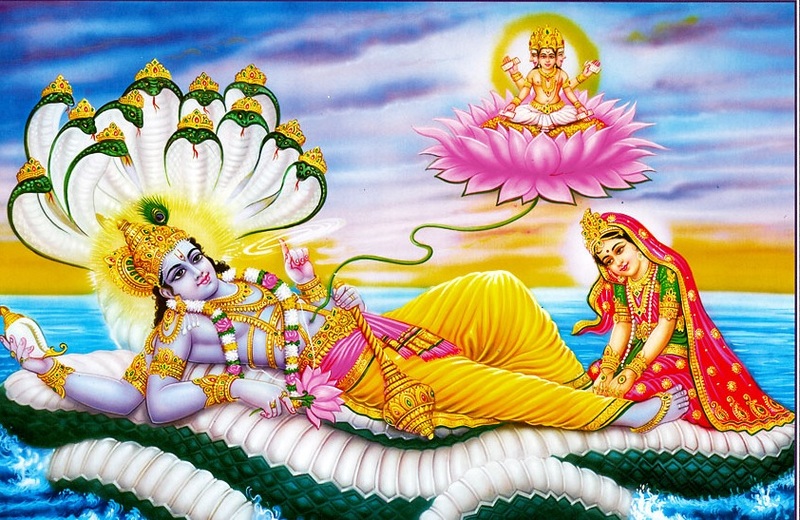 God Vishnu’s navel is a perennial enigma and even creator of this whole universe, Lord Brahma too has not been able to fathom the secret of it. On the lotus which appeared from this navel, Lord Brahma was incarnated in the very begging, before universe formation. God Vishnu’s body is told Maha Sthan (biggest place) and inside this biggest place, no type of time works! This biggest place is the entrance for transmitting to countless no. of universes. This biggest place can be termed as biggest laboratory where many Brahmarshi (most powerful saints or Rishi) continuously research on infinite expansion of Bhagvan (God). Doctor Saurabh Upadhyay further tells about the reasons of all planets’ movement in circular (elliptical) motion necessarily. Mr. Upadhyay says, though there are several complicated reasons behind this phenomena, yet one of the important reason is, the relation between future and past, means which is future that is also past, and which is past that is also future! When a planet moves in such circular path, then the point which comes in front side of planet’s path, that point is the future of that planet but when that point is crossed over by that planet, then that future point turns into history point of that planet. After moving a cycle, when that planet comes back near to that history point, then automatically that history point becomes again future point for that planet. Therefore the maxim of ‘history repeats itself’ is absolutely accurate because seeds of future remain hidden in history itself. This can also be understood by the example of story of shri Kalki incarnation, written in Bhavishy Puran (an ancient Indian holy book). In this book, all the activities of shri Kalki avatar, which will take place in future, are written in a manner that those things already have happened in past! The same concept is also applied here that the future of someone is past of someone and past of someone is future of someone! However, any event is also recognized by its dimension. In a same place, in same time, lots of different events can be occurring, if the dimensions are different. Generally people know about 3 dimension, length, width, height, but according to Hindu religion dimensions are endless. People who live in different dimensions can not see to each other despite existing in same place. Higher cosmic power gives ability to reside in higher dimensions. Till the seventh dimensions Nag, Yaksh, Gandharv, Kinnar, Kirat, Vidyadhar, Riksh, Pitar, Dikpal, Prjapati, Devta (these species are considered/termed as aliens by today’s modern scientists) etc live. Lord Brahma made total 11 dimensions in this universe. Though dimensions are infinite but the complete information about all the dimensions are known by Bhagvan (God) only. Some information about difference in dimensions can be understood by this example; if you see an opened door of a room from some distance, then only a small area is visible to you in the direction of door, but when you come near to the door of room, you see that room has not only length, but width too. And when you come inside the room, then you find that along with length, width, room also has height. In the same way, by the continuous practice of Yoga (Hath Yoga, Raj Yoga, Bhakti Yoga, Tantra Yoga) the capability of divine visibility raises inside the human being to understand and watch beyond the three basic dimensions. It is necessary to have required advancement of consciousness by a human being to see the divine species (like Nag, Yaksh, Gandharv, Kinnar, Kirat, Vidyadhar, Pitar, Dikpal, Prjapati, Devta etc) who reside in higher dimensions. Actually all these special species are so much advanced in science and technology that modern science follower scientists assume their technologies beyond imagination. All these species’ science is based on core Hindu religious knowledge which is mentioned in very hidden and secret form in most ancient books of world Vedas. In Vedas the Mantras (spells) are written in Sanskrit language and every Mantra of Vedas has several meanings which can be deciphered by only those saints who have great spiritual power, not by a simple Sanskrit translator. A Sanskrit translator may feel the meanings of Vedas Mantras very ordinary and similar to simple worship chants, but reality is much far away from this, because all these Vedas Mantras are very high level science formulae that can be understood by only and only very efficient Yogi (Hath Yogi, Raj Yogi, Bhakt Yogi, Tantra Yogi). The ancient Hindu science knowledge had been kept extremely secret and confidential so that any undeserving candidate can not misuse such precious knowledge. It is not so that these divine species were found only in ancient age! These special species are still there in today’s era but the problem is that there are only limited people in the world who have the requisite higher level of consciousness to see and talk with these special species. Only those saints who have higher level of spiritual power can see and talk with these divine species. 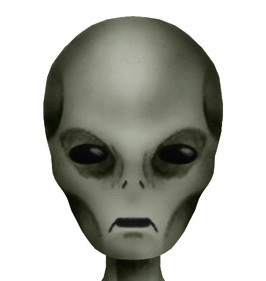 In reality, there is no existence of grey alien! The theory of grey alien is only rumor disseminated by few people. 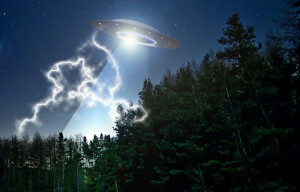 In actual, above mentioned special species seldom come to earth by their special flying devices, to help human beings and whoever human being luckily see their glimpse, assume them as alien and their flying devices as UFO. Nag are half deity kind of species. The meaning of Nag is not snake, because in Sanskrit language the meaning of Nag is, the people whose size and shape are not fixed. Nag species worship Lord Vasuki, who is another incarnation of God Shiva. Nag people are famous for their very advanced weapons and bravery that’s why whenever any war is waged between Devta (deities) and Rakshas (devils), deities seek help from Nag to fight against devils. Nag people generally never break their promises. Yaksh people never die until they generally themselves wish to die after losing interest in living any more. Actually Prana (life or soul) of Yaksh which reside in a hole near Yaksh’s navel, remains covered by Amrit (ambrosia). Whenever any Yaksh wants to die, he gets this Amrit dried up in navel by Yoga Agni (Yoga fire). The king of all Yaksh, is shri Kuber who has immeasurable treasure of gold, silver and priceless gems. Shri Kuber is himself a great devotee of God Shiva and by the blessing of God Shiva, he became the richest of all. Gandharv are tremendously preeminent in Sangeet (music), Nritya (dancing), Vyuh (arrays formation). The science of Sangeet (music) is so vast that it’s impossible to find out the bourn of it. The sovereign owner of Sangeet (music) and all form of knowledge is goddess Sarswati. World’s all level of tasks can be accomplished by the help of various secret and intricately mysterious Sangeet. During Mahabharat period, lady Gandhari, the mother of prince Duryodhan was also a Gandharv lady. Pitars are those gentle fore fathers of human beings, who got opportunity to reside in Pitra Lok (planet of Pitars) after their death! Pitra Lok is a divine planet where all the superlative facilities exist and hence any soul get opportunity to reside in Pitra Lok only when he had done ample of humanitarian works for poor, needy people, before his death. In spite of many divine facilities, no soul wants to stay in Pitra Lok for longer period because here, for getting satisfaction, every soul is dependent on their descendants who are living on earth planet. Pitar get satisfaction by Antyesti (funeral rites like Pind Dan, Tarpan, Shradh etc.) and the rituals after death are done by living sons or grandsons. If any son or grandson follows the complete procedure of such rituals then he gets the priceless blessings of his fore fathers and these blessings protect him from many accidents and dangers in his entire life. In Devta (deities) species many levels are there. Devta belonging to seventh dimensions are called most powerful Devta. Some people do understand Devta (or Dev) are Bhagvan (God) which is not correct because Devta are only species like human beings but no doubt Devta has lots of extreme super natural powers that even we can’t imagine. So if we see only our earth, we find that our earth is so much vast that thousands of its secrets are still unrevealed, and including numerous other planets like earth, a universe is formed. Our Vedas say that infinite no of universes exist in every cell of Bhagvan’s body (God body). And during Mahabharat period when Arjun got to see the profoundness of His body, Arjun was not able to stand this inconceivable scene. It’s really a generosity of Almighty Bhagvan, that the incapable creatures like us, can also proceed to understand all about of Him. भूकम्प जब हिलाने लगे शहर को, तब आप क्या क्या कर सकते हैं ?